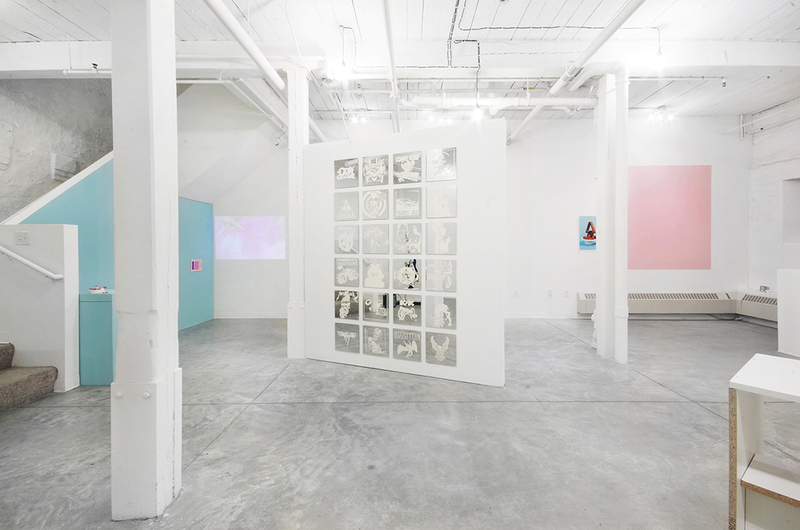 Besides is the second installment of a two-part exhibition focused on subtle, persistent revolt. Through the implementation of pale, muted, and pastel colors the artists reference the mundane aesthetic commonly associated with necktie collections, tupperware parties, office climate or holiday decorations. These interdisciplinary works feel familiar and reveal an underhanded, yet delightful rebellion upon continued investigation. By splitting the exhibition into two parts, curators Corey Oberlander and Lindsey Stapleton are able to explore two separate manifestations: the mental and the physical rejection of domestic urbanity. The five artist exhibition includes Eddie Villanueva, Keegan Grandbois, Allison Baker, Sandra Erbacher and Jessica Lawrence. Focusing on a tangible rejection, this installation will include objects, environments and activities that fail to adhere to their usual responsibilities - finding surprising elements of defiant personality in otherwise stereotypical places. Unagressive, aesthetically pleasing, and slightly ambiguous, the pieces in this exhibition will be presented in an unassuming manner - laid out like a casually furnished living space. The work in the show will sit firmly between the familiar and the rebellious, asking the viewer to reassess their understanding of their place within the artists' environment. Tonally, expect anti-jokes and anti-art; the lack of punchline becomes the punchline without wavering into either criticism or traditional humor. Eddie Villanueva's Guitar is a coin-operated guitar on top of a re-purposed grocery-store kiddie ride. Energized by a single quarter, the guitar lunges into action playing the self-actualized drone of The Beatles' "Tomorrow Never Knows", the seminal masterpiece and closing track of Revolver. The song is one prolonged C chord with reverse tape loops a constant drum beat. Keegan Grandbois' prints hang scattered throughout the gallery. Simultaneously of still life and autobiographical tradition, his compositions trigger a ubiquitous nostalgia while remaining personal and sincere. Allison Baker subverts traditions of domestic femininity through sculpture, video and installation. in BESIDES, she presents two videos documenting anonymous women preforming overtly feminine actions. In each piece, the action quickly moves past the expected ending and pushes the viewer to endure something significantly more arduous. Jessica Lawrence works with the associative nature of materials through explorations in object placement, photography, and varying levels of digital and material manipulation. Her digital prints and coffee-table sized furniture pieces exemplify subtle shifts in perception that occur when an object's inherent qualities are reconstructed or manipulated to defy their intended use. Sandra Erbacher's large sculpture resembles an Ikea DIY project gone wrong. Originally a standard item from the Swedish furniture house's oevre, Erbacher has cut, manipulated and re-joined in a way that is both considered as it is nonsensical; reflecting the endless effort of someone who is trying to follow instructions yet does not understand the workings of the separate parts in the bigger picture. A separateness, an aside; the works presented in Besides do not outwardly mock, criticize or deride the systems they reference. Instead, these pieces actualize a common trope in contemporary society: the causal belief that that the masses go with the current and the individual goes against it.